Mission team led by Health Minister Nguyen Thi Kim Tien yesterday arrived in two serious storm-hit central provinces of Khanh Hoa and Phu Yen to direct disease prevention as its aftermath. 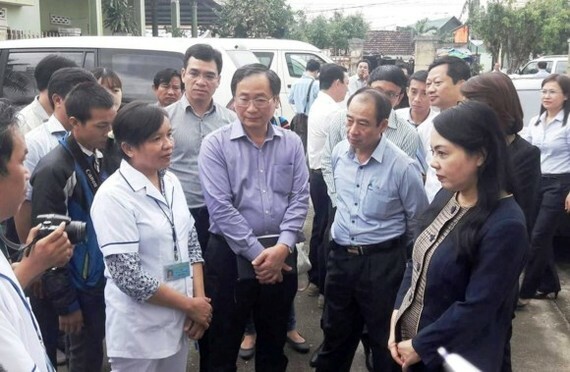 In Khanh Hoa province, Minister Tien came to two medical centers in Binh Ha and Ninh Phu communes in Van Ninh District that are seriously affected by the storm. The Health Minister shared the difficulties with the two clinics encouraging medical workers here to surmount it. She gave the two clinics each an electric generator in case that power is out. Then she toured to the general infirmary in Ninh Hoa Commune which suffered loss of VND4.3 billion. 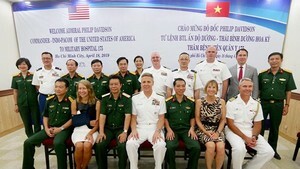 In Phu Yen province, the mission team dropped by medical clinic An Dinh which are submerged in one week. TheHealth Minister expressed her sympathy with medical workers who work in poor repaired facilities as the aftermath of the storm. She presented a set of computer to the clinic promising to support the construction of new clinic. Khanh Hoa health sector proposed more drugs, disinfectants and ventilators for an infirmary in Ninh Hoa Commune, XQ machine for the Lung Hospital, Ms. Tien ordered related agencies to liaise with the Khanh Hoa health sector on the matter. She confirmed the Ministry will provide enough disinfectants following Phu Yen’s request on chemicals to fight against waterborne disease after storm. She added the Ministry would find out source to assist building new infirmary in Phu Yen. Especially, she asked the health sectors in Khanh Hoa and Phu Yen to strengthen information of disease prevention and have safe food, water.